Champs21: Dare to learn ! With the vision of combining education with fun, Champs21 has recently re-launched its website in a newer and broader aspect .The new website, targeted to blend fun with curricular knowledge has come up with an entirely refurbished look and feel .Champs 21 has also taken the broader objective of grooming up the future minds so that they are well prepared for all kinds of analytical and mathematical challenges. After a successful event of the first interschool online quiz competition “Brain Brats”, Champs 21 launches a new and enhanced version keeping in attention as to what our students want to see in their very own e-learning site. Starting from Math games and sudoko puzzles to comic serials and also self assessment test packs, you will get it all in this one website. In the new site, youngsters from class 3 to 10 will find that gaming is all about how well you know your Algebra and geometry. Lined up in the new website are a whole lot of graphically enhanced super cool games. Online encyclopedia, inquisitive jokes and a bit of comics will work to relieve your stress. It doesn't end here ,Champs21, offers a complete lifestyle package, which includes a personalized home page to the students where they can spend their time reading online story books like Gopal Bhar, NasirUddin Hojja and so on. The extra Academic section also offers Jokes and different facts to improve a child's general knowledge; a forum where students of same class can write to each other. “Champs21 is my new facebook, where I can have fun and learn at the same time” said a regular visitor of the site who also happens to be a topper in the class. Your brains will be put to the ultimate test with the new math applications and general knowledge tests of “Mathoholic “ & “Daily Quiz”. “Spelling Bee”, a very popular global concept where the youngsters strive to prove their excellent command in spelling is now a reality of the young champs at Champs21.Champs21 will shortly introduce an “online spelling bee” competition to engage our young minds towards spending constructive time in the internet. Ever wondered how long it takes to travel around the world? Or what is the weirdest animal in the face of our planet? With Daily Quiz, The World is Your Syllabus. With facts that are hardly found in textbooks, test your knowledge and learn something new everyday. The quizzes designed at Champs21 are based on different topics on general knowledge including sports, music, I.Q, current affairs and so on. On the starting of the new year Champs21 offers the students a really attractive offer. 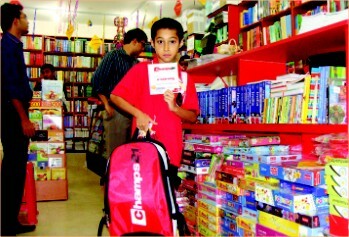 With every license, Champs21 now offers a champs school bag for FREE. “The logo embedded school bag complies really good with my school outfit “says Dihan who has recently bought the license. Sathi, a student of class 8 quotes that “Champs21 is quite fun and at the same time I am learning a lot too , I especially like the math games.” “The self assessment tests also help me prepare for my class tests “she also added. In October 2010, the country's first ever online education portal www.champs21.com was launched with the vision of providing quality education to all. With the unanimous support and patronization of The Daily Star with the new promise of taking online education to a higher level, Champs21's new site is another step closer to popularizing and encouraging E learning in a holistic way. The world of the Internet has so far - for most people - been only for social networking or random browsing and downloading. That the Internet is a great resource for academic help - though known to many - is not utilised by most. With the advent of Khan Academy, people are beginning to understand the role of the Internet in studies. It is a common scenario in Bangladesh that students complain that their books are inadequate to make a topic clear or the teachers' explanation just confuses things more. The Khan Academy is a major life saver in this respect. Khan Academy was started by the Bangladeshi American Salman Khan with the motto of "providing a high quality education to anyone, anywhere." Salman Khan- a MIT graduate- states in the official website that "I teach the way that I wish I was taught. The lectures are coming from me, an actual human being who is fascinated by the world around him." The site contains more than 2400 videos which encompass subjects from Arithmetic, Calculus, Physics, Chemistry, Astronomy, and Finance to History and Brain Teasers. Logging in, one can even practice and earn badges and keep track of their progress. What started with a simple video with Yahoo! 's Doodle notepad to teach his cousin math, gradually turned into a huge collection of online videos. People who have used Khan Academy commented on it being extremely helpful, especially because Khan uses simple analogies to give the viewer an intuition to the subject being taught. With a virtual blackboard and easily comprehensible words, Salman Khan goes about explaining topics on different subjects. Other great resources for the interested include OpenCourseWares which is provided by many universities. These are virtual learning environments provided by different colleges which include lecture videos, notes, exam questions and solutions. The OCW was first started by MIT and later many other universities followed. These include Berkley Webcast, Open Yale resources, Notre Dame OpenCourseWare, Harvard etc. 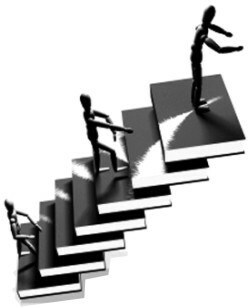 The lectures are provided under a creative common license and so can also be downloaded. The MIT OpenCourseWare for example provides online course material from aeronautics, physics to history and literature. The physics lectures on motion by Professor Walter Lewin have been said to be especially helpful by students who have used it. For students who want to understand the concepts a little better and for the ones who want more in-depth knowledge - the Khan Academy and OpenCourseWares are treasure troves waiting to be explored. Recently, One Degree Initiative together with Khan Academy and Agami has started translating the Khan Academy videos to Bangla for students in Bangladesh. No question about it - the Internet is a great place for people interested to learn. The Khan Academy on one hand provides basic resources which may be very helpful for students who have a hard time getting their heads around the concepts and the course wares are there for those who want to learn more. Speaking from personal experience, these resources sometimes clear up major misconceptions which otherwise most of us continue to believe. This month the RS Mailbox has been buzzing throughout. Compliments, arguments and criticisms have ivened the Facebook fan page alive while our inbox too has received its fair share of mails as well. "The Beaches" by S.N.Rasul was fabulous!! I somehow connected with it. The cover story was pretty good too. Looks like RS emphasized mainly the water bodies and rain in today's edition!! Good going! It's good to see Rasul back with his 'Rasul'ness. And this week I learned so much about body languages and of how it 'rains' cows sometimes. And of course, that review on Rantages, it really needed one. Overall, an issue that I can wait an entire week for. Teen Budget 2011-2012 was amazing! As well as The Fall, it gave me the chance to know more about Bangladeshi History! Really nice cover this time around ( Battle of Polashi)! But try reviewing better books. For example-- Runemark, A thousand splendid suns, Alex rider, Artemis fowl, etc the most popular ones really catch a readers attention. Also try not to make any more articles about boys versus girls and what not because trust me that ship has sailed a long time ago. And most of all Where are the anime reviews? Great issue! Each article was worth reading! NICE! I liked how the cover and the back were based on the same theme!